During Farm Safety Week (24-28 July) The National Federation of Young Farmers’ Clubs (NFYFC) is calling on its 624 clubs to commit to delivering a potentially life-saving farm safety training course to its 25,000 members. YFCs are being asked to ‘pledge’ their commitment to putting the training on their Club Programmes during the 2017-18 membership year and NFYFC has developed a series of ‘pledge cards’ for its 25,000 members to use on social media during the week. NFYFC’s Chairman Ed Ford from Essex Federation of Young Farmers’ Clubs (FYFC) with (left) Vice Chairman Katie Hall from Gloucestershire FYFC and (right) Vice Chairman Lynsey Martin from Kent FYFC. The training, which has been developed with the Farm Safety Foundation – organisers of Farm Safety Week, has been created to ensure the next generation of farmers is more aware of the dangers and can help to instigate changes. Farming continues to have one of the poorest safety records of any occupation in the UK and Ireland but all the main farming organisations are working together during the week to address this. The latest annual figures from the Health and Safety Executive show that out of 137 people killed or fatally injured in workplace accidents last year, 27 worked in agriculture. 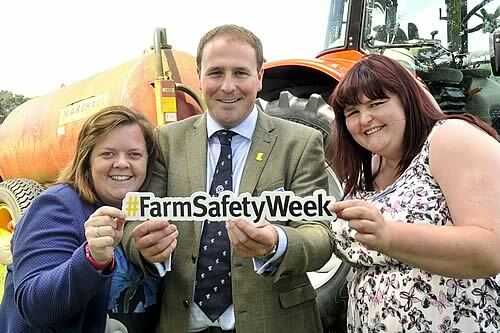 YFCs and members are also supporting the week by sharing materials from the NFYFC’s social media pages, from Yellow Wellies’ social media pages and using the hashtag #FarmSafetyWeek. The Farm Safety Foundation’s message for the week is farm safety – it’s a lifestyle not a slogan. The farm safety training is part of NFYFC’s suite of training courses called the Curve. These sessions are delivered by NFYFC’s certified trainers in clubs across England and Wales and are aimed at developing skills and raising awareness on a range of topics.